Raspberry Pi owners looking to use higher voltages with their mini PC, might be interested in this new opto-isolator board called the Opto-pi which has been specifically designed to be used with the awesome Raspberry Pi mini PC. The Raspberry Pi Opto-pi board has been created to make interfacing with the 8 digital GPIO pins on the Raspberry Pi mini PC much easier. 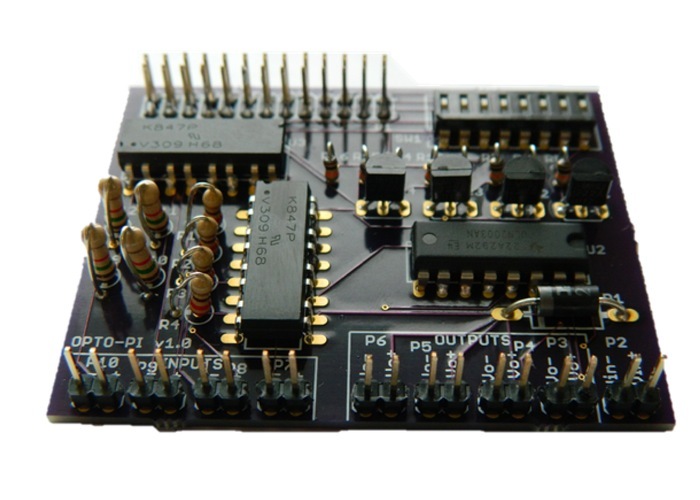 Allowing you to connect higher current devices as well as higher voltages directly to Opto-pi board itself when needed with ease. “I found myself creating circuits to interface the Raspberry Pi to higher current loads and higher voltages. I wanted a simple, flexible, and quick way to connect the Raspberry Pi to motors, relay coils, high power LED’s and more. So, opto-pi was created. Opto-pi plugs directly into the 26-pin header on the Raspberry Pi, making installation quick and your projects neater. – Plug Opto-pi into the 26-pin header on the Raspberry Pi. – Apply power to the Power Input pins. – Attach loads (motors, relay coils, LED’s, etc.) to the Output pins. – Attach input signals to the Input pins. – Configure corresponding GPIO pins as inputs or outputs in your script. The Opto-pi project is currently over on the Kickstarter crowd funding website looking to raise enough pledges to make the jump from concept to production. So if you think Opto-pi is something you could benefit from, visit the Kickstarter website now to make a pledge and help Opto-pi Opto-Isolator Board for the Raspberry Pi become a reality.